This is a guest post by my friend Sean Sakamoto, who blogs at www.idratherbe.tv/injapan. "It's so weird that you heat your whole house," my wife said one winter. She's Japanese, and when we first got married, here in the United States, we got a lot of mileage out of the "I can't believe you people actually do this" conversations. Recently, we moved to Japan and the tables have turned. It's my turn now and, among other things, perhaps my biggest culture shock was, at first: "I can't believe you people don't heat your houses." That's right: there is no heat in our new Japanese home, and in this culture, that is not remotely unusual. Despite growing up in Michigan, I have always been a total wimp about the cold. That's why, when we decided to move, my biggest worry was surviving the winter. The language barrier, the food, the culture shock, all seemed manageable, but not the cold. I have always hated being cold, especially indoors. It's been four months, now, and we're in the dead of winter. We live in a rural village. Our apartment is concrete with no insulation. My breath clouds the air; it condenses on the windows and turns into a sheet of ice. I wear a wool cap to bed, to breakfast, and everywhere else. I've always thought that it's just not supposed to be cold inside, but as far as the Japanese are concerned, I thought wrong. Like the fish for breakfast, I've adapted to the situation much faster than I expected. As is usual for me with most things I used to dread, I've even come to see some great benefits my new situation. There is an upside to having a freezing cold home. The best part about it is a something called a kotatsu. 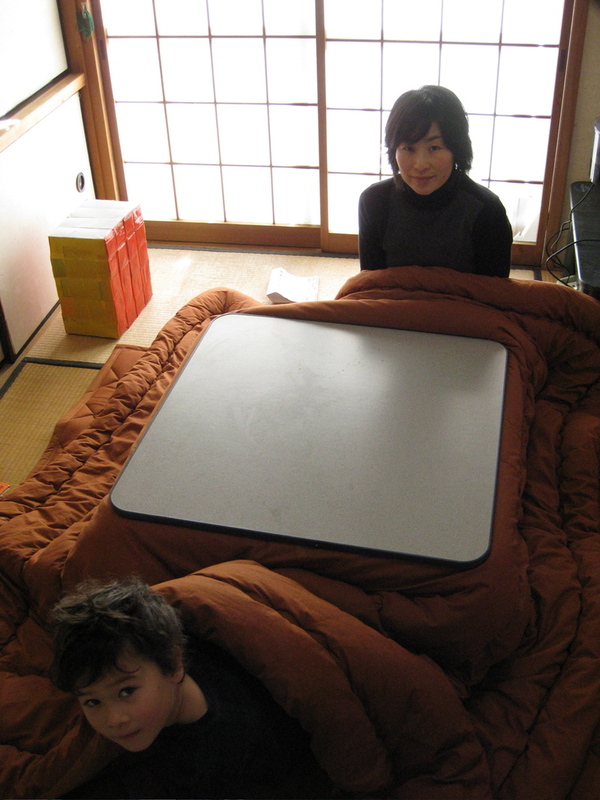 The kotatsu is a low table with a small electric heater underneath. There's at least one in every home (that's my wife and little boy sitting at one in the photo). The top of the table lifts off, and a quilt goes over the legs. Then you put the top back on. Everyone sits around the table with the quilt over their laps, and the heat keeps your lower body warm. It's cozy, like sitting by the fire. Because the rest of the house is freezing, the kotatsu gets a lot of action. It's the first place I go in the morning, and the last place I leave at night. We eat at the kotatsu. We enjoy nabe, long family meals with a pot of boiling water on a portable burner. We dip meat, veggies, and noodles into the pot and then scoop them onto bowls of rice. The boiling water heats the room, and the hot meat and veggies taste great. When we're not eating, we play board games around the kotatsu, or just sit quietly and listen to music. Another strategy for surviving the cold is the hot bath we share at the end of the day. We have a tiny, but deep bathtub. We fill it up with freezing cold water, and then fire up the propane heater next to it to warm up the bath water. All of use the same bath water, but it's much better than it sounds, because before we get in, we scoop the water over our heads, soap up and rinse off. Then we take our turns squeezing into the tub. That heats us up enough to make the transition into bed, carrying a hot water bottle to keep our feet warm all night. We don't drain the tub, we pump it into the washing machine the next day do to the daily wash, which we hang up in the hallway. Even in the winter, our clothes dry in a couple of days. We're not alone. Part of what makes this situation bearable is that everyone does it. We're not making some sacrifice that everyone else forgoes. I have no one nearby to envy. At the high school where I teach English, all the students and teachers have a kotatsu at home, they each bring a hot water bottle to bed, and they all wake up to the same freezing cold air. We're all in it together, and I'm the only person who even knows anything different. There's another reason I appreciate this new experience, too. It is what the Japanese call "Gaman." It means "endure," or "tolerate" but there's more to it than that. It ascribes value to enduring something difficult. To Gaman is a principle, its a virtue. It's a cross between hanging in there and fighting the good fight. There are times when gaman is a pain. Sometimes enduring hardship as a virtue when the situation could just as easily be made more comfortable seems nuts. But as a cultural value, doing your best and enduring hardship is refreshing. I won't speak for other Americans, but my experience has often leaned too far the other way when it comes to putting up with difficulty without complaint. I like finding the easy way, I seek comfort, I reach for whatever might soothe the least bit of discomfort I feel. This wouldn't be so bad if it actually worked. But too often I've emerged woozy from another day of escapism and wondered if there wasn't another way. The connection between comfort, consumption, and happiness seems to be more tenuous than I once thought. Here I am in Japan, my fear of a heatless winter come true, and I'm happier than I've been in years. The unintended result is that I'm consuming less resources, though that was never really a goal of mine, spending much more time with my family, and feeling a strange satisfaction in knowing that I'm taking the more difficult path and doing just fine. It's got me wondering about the value of gaman and how it fits with living a more sustainable lifestyle, and how maybe it's not that foreign a concept. Wasn't there a time in America when hard work was valued just for the fact that it was hard? Weren't we more stoic in years past? I'm really asking because I have no idea, just a feeling. I always mocked the scorn of the old timers when they told me how they walked miles in ten feet of snow uphill both ways to school and back. The Grandpa Simpson's of the world whose quaint sacrifices seemed hopelessly outmoded. Still, there was a pride in their voices that I didn't really understand. Now, maybe, I do. I like huddling around the kotatsu, the simple pleasure of a hot bath at the end of a cold day, and the hot water bottle at my feet. I like putting up with the winter chill. And the great news is, I don't have to worry about leaving the milk out.